Thirty-seven AT&T Mobility Tennessee Cell & Switch Technicians have joined CWA. "We are so happy here in Tennessee that we are now a part of CWA," said organizing committee member Shane Reed (pictured below, at right). "Now we have a voice in our workplace, real regular pay raises, standby pay, and travel pay to name a few things that contract guarantees. These are things we've never had before. Proud to be CWA Strong!" 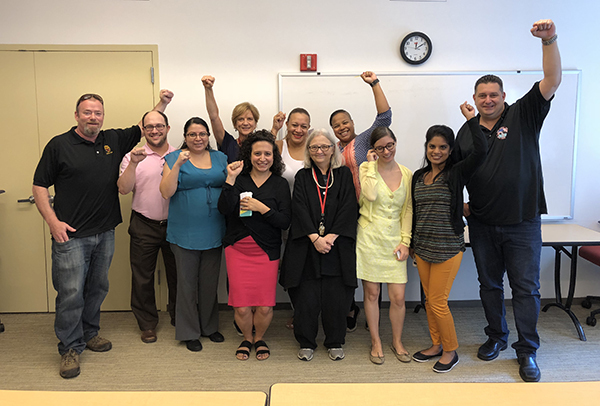 About 15 exempt staff at the Cornell School of International Labor Relations School (ILR) in New York City, including program and research coordinators, voted to join CWA. Aug 9, 2018 - CWAers Defeat Right to Work in Missouri!